Did you know that most paper cups are not recyclable? In the US alone, over 50 billion paper cups end up in landfills each year. Quite simply, traditional paper cups are not designed to be recycled — and recyclers are not set up to process them. These cups are just too difficult to run through their existing paper recycling equipment due to a 100% polyethylene (plastic) coating on the inside of the cup. This coating can't be processed efficiently and would clog their machines — so paper cups are typically sorted for disposal at landfill. Currently, paper cups end up in the dump. Instead of indicating that the "Landfill" section is for conventional paper cups and lids, the message is simply "No Paper Cups or Lids" at the bottom of the list. Despite what people may believe, paper cups just aren't recycled. We have a smart solution. 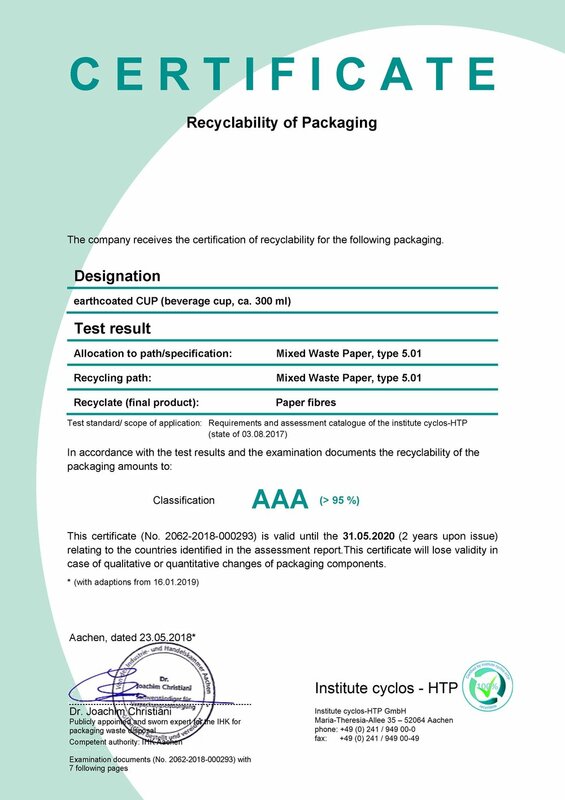 The reCUP® has successfully obtained numerous industry standard recycling certifications. Please see our Repulping Report for more information. reCUPs are engineered to be recyclable. Paper cups made with EarthCoating® qualify for a AAA rating for recyclability from Der Grune Punkt (Green Dot). Paper cups made with EarthCoating® (reCUPs) are being collected from curbside recycling bins for repulping. Detpak Launches RecycleMe™ closed-loop collection program in UK with Shredall. Smart Planet Technologies received the 2017 Green Arrow Award for System Design and Innovation for reCUP.